The 2019 Yamaha Sidewinder B-TX LE and M-TX LE offer up industry leading power with the added benefit of Yamaha’s history of making snowmobiles that last year after year. Who in the heck wants a 200-plus horsepower crossover or mountain snowmobile? What could you possibly do with all that horsepower under the hood? Bust some loose powder. Topple a mountain. Burn through some trails. There is something truly unique about Yamaha’s mountain masher and deep-powder crossover, the Sidewinder M-TX LE and B-TX LE (“M” for mountain, “B” for boondocker). The 2019 Yamaha Sidewinder B-TX and M-TX come as LE only – Limited Edition – and are Yamaha’s Spring-buy fully-loaded gadget-infused “Power Surge” models. These two LE models come all twisted up in some wild colors that are mesmerizing to look at; these are Hi Vis Racing Blue and Green. The color combo is awesome, to say the least. 998 Genesis Turbo Engine. This is a three cylinder electronic fuel injected four stroke motor that builds 200 horsepower. The double century mark is slightly conservative where the 998 c.c turbocharged motor breaks out between 205 to 210 horsepower. YSRC High Performance Clutch System. Yamaha’s YSRC primary clutch (drive clutch) and roller secondary clutch (driven clutch) were specifically designed for the turbocharged Genesis motor to be robust and to run cool, and to help the drive belt remain cool. Each clutch must receive the motor’s horsepower and torque and take the twisting forces from the crankshaft and efficiently transfer these to the track drivers. Stealth Control System, new for 2019, where the handle bar controls feature a left hand switch cluster which allows for “on the fly” access to the new multi-step hand and thumb warmer adjusters. Information available on the multi-function gauge can be easily selected with a convenient toggle switch. Electronic Air Bypass Valve (ABV) is unlike conventional turbo blow-off valves, the ABV redirects air pressure back into the intake side of the compressor to prevent surge and help maintain impeller speed. As we met with the four snowmobile manufacturers this past February and March at Snow Shoot 2019, West Yellowstone, Montana; Yamaha, in a meeting with numerous snowmobile magazine editors, said its snowmobile division for North America will limit production in Japan to mostly “build-to-order.” Meaning, Yamaha will build as many new modelyear 2019 snowmobiles as its dealers ordered. The B-TX LE and M-TX LE share the same cockpit; J-hooks, mountain grab strap and minimal controls. Currently, Yamaha and its dealers have enough new non-current modelyear snowmobiles – 2018 and older – that meets most buyer’s needs; Yamaha’s inventory pipeline needs to vacate. Yet, Yamaha will build a limited number of its high-end LE model line and deliver these to its dealers’ Power Surge customers. High-volume dealers with a proven sales record of moving many snowmobiles and having a low number of holdover snowmobiles, or none at all, can order more 2019 Yamaha Sidewinder B-TX and M-TX LE models to keep on hand. Yamaha’s record books will qualify the dealers that can order more snowmobiles beyond “Power Surge” numbers. 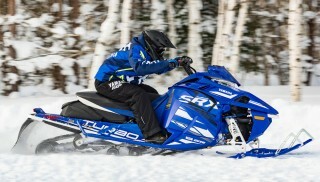 Yamaha is restructuring its mission and vison plan for its snowmobile line. Yamaha believes in the snowmobile market, and we did learn, Yamaha does not want to abandon it; Yamaha is driven to keep its winter-time dealers healthy. For winter season 2018, what model snowmobile led Yamaha’s sales? Snoscoot. That OK, but the model that climbs high atop a mountain or takes to boondocking in the backcountry meadows. In our conversation with Yamaha, we implored Yamaha to study Polaris’ Ski-Doo’s and Cat’s successes (each have had painful setbacks followed by a profitable recovery). 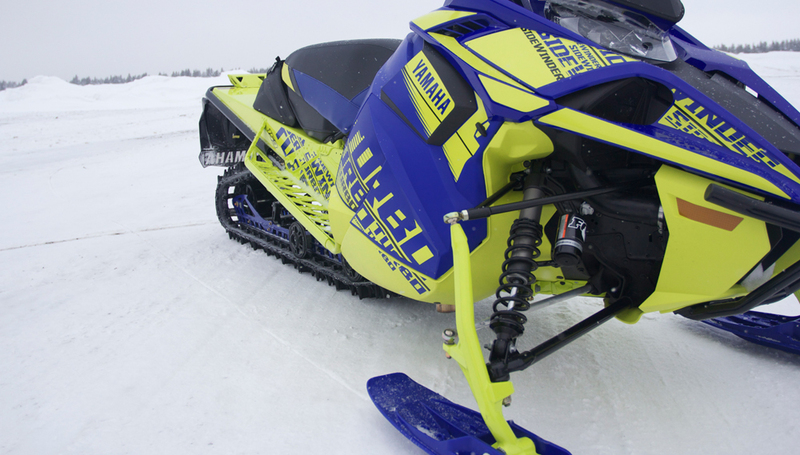 One ingredient to successful snowmobile sales is a 2X2 – two cylinder two-stroke. Look, we can’t ignore the fun a 205 to 210 horsepower motor delivers when whacking a mountain or when straightening the curves, but the Sidewinder’s weight makes, for example, the M-TX LE not a mountain rider’s first choice, unless the rider is a big chute shooter. Yes, the 2019 Yamaha Sidewinder B-TX and M-TX LE have excellent power-to-weight, but one must still leverage the Sidewinder’s weight through the bars. Whereas, weight from a lighter Polaris Pro-RMK or SKS, a Ski-Doo Summit or Backcountry, or an Arctic Cat Alpha One or High Country, is a fleeting matter – a non-issue (mostly). Yamaha has the engineering smarts and skills and to create a fantastic two-stroke motor. Yamaha’s relationship with Textron/Arctic Cat is solid, and with Textron/Arctic Cat selling to Yamaha a good chassis, all Yamaha needs to do is reach back to its roots, its YZ 250 motocross roots, and grow a fuel injected two-stroke twin cylinder motor. Nissan could not compete against Toyota, Dodge, GM and Ford with its Titan pickup line. After years of minimal full-size pickup sales, Nissan began building a new half-ton line, one model with a Cummings diesel. Nissan is now in “the truck” business. 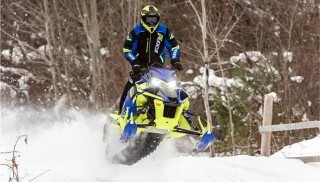 So, Yamaha, we at Snowmobile.com know you can survive – will survive. 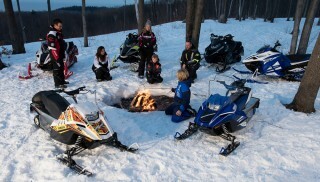 We like your quality and your ability to build long-lasting snowmobiles. Keep ahold the boosted Genesis motor, but too, shake the market with a new 850 or 900 twin cylinder two-stroke, and tear ‘em up. The 2019 B-TX LE from Yamaha is all crossover. But, it is a long crossover, a 153. Yamaha has awesome technology in its B-TX LE model. 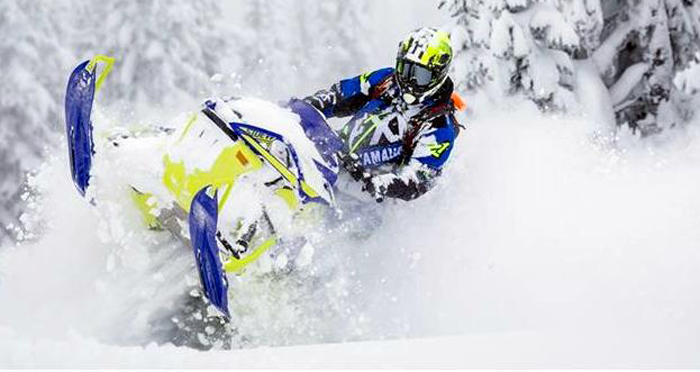 The crossover market continues to a healthy market segment for the four builders, where demand for such a purpose-built snowmobiles helps steer Yamaha into a profitable market. Our seat time on the 2019 Yamaha Sidewinder B-TX LE 153, which covers three model years, tells us when the triple 998cc Genesis turbo engine winds up and unwinds on the trail, its smooth RPM is manageable. Novice riders to the most experienced riders will find the B-TX LE 153 both gentle and blinding fast; it deserves a rider’s respect because the four-stroke motor is cat burglar-quiet and jet airplane fast. The B-TX LE has character. It can be an intimidating character at times, but as recently mentioned, if you want the over 200 horsepower to be tame and docile, it surely can be. 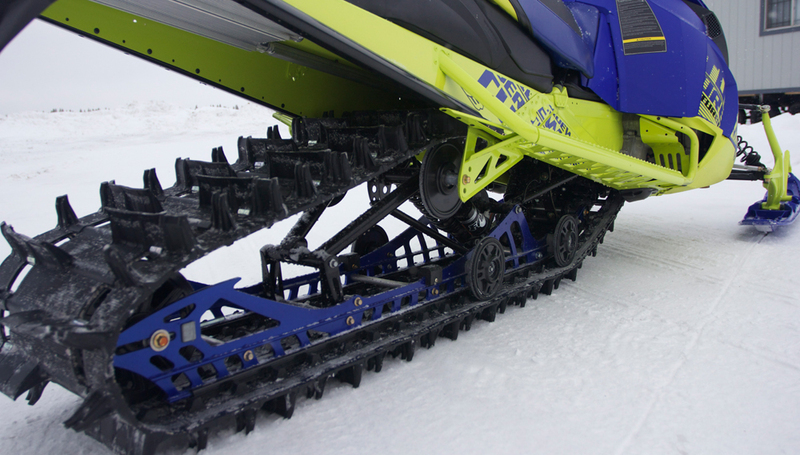 This system makes this crossover snowmobile, as well as companion deep-powder bomber, the M-TX LE, forgiving when running off a hill or decelerating from a high-speed trail run. When following two-stroke counterpart snowmobiles, the 2019 Yamaha Sidewinder B-TX LE is at home, provided the snow does not exceed two feet. The B-TX LE with its wide ski stance can become a difficult critter to set on edge, even in the correct conditions. Our testimony is, if taking the B-TX LE off-trail, tighten the ski stance to its narrowest setting. The B-TX’s handlebar configuration does allow for smart standup riding when playing in ravines. With a heavy motor over its ski spindles, the B-TX LE when set on edge to carve a sharp turn on Spring-like crusty snow, will cut the snow and dive through the depth hoar, and then will jettison its driver. Following this, as the B-TX LE rolls to its side, it comes to a stop with its bumper and belly pan lodged under the crust, and the on-edge ski pointing straight up. The best way to overcome this is to anticipate your on-edge turn and have sufficient speed to transfer motor weight to the track. Standing with feet positioned behind the front shock helps as well. The 2019 Yamaha Sidewinder B-TX LE is equipped with one of the best mountain skis on market, if not the best. But, understand when on the B-TX LE is on edge, the motor’s weight wants to force the on-edge ski down into the snow as we just mentioned. 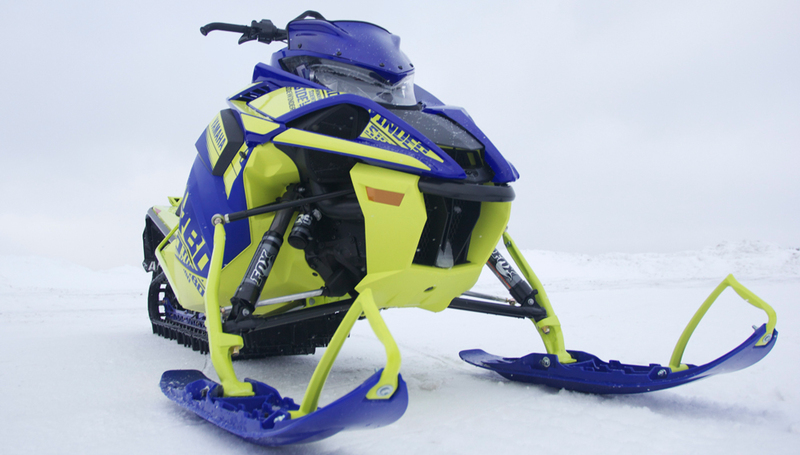 Minus the above, the B-TX LE is a fine crossover snowmobile. Its boost, its ride, its ergonomics (seat, runningboard and mountain-specific handlebar) are user-friendly, making this high-horsepower crosser a friendly, albeit, an aggressive crossover. The tall PowerClaw 2.25-inch track that is 15 inches wide, handles the boosted motor’s horsepower very well. By way of café talk, the 2019 Yamaha Sidewinder B-TX LE is the longest of all crossover snowmobiles. Taking some time to learn the Sidewinder M-TX, as this LE, brings great rewards. We don’t deny its weight, but we also don’t deny is playfulness. Photo by Yamaha. The benefit a long 162 mountain snowmobile receives from a turbocharged four-stroke motor is consistent, and virtually the same, horsepower from 100 feet to 10,000 feet. The M-TX LE as it climbs in altitude, its 200-plus horsepower goes with it. The 2019 Sidewinder M-TX S LE is fun to ride when boost is loose and its three-inch PowerClaw track unleashes its claws. Yet, when chasing lighter two-stroke-powered mountain snowmobiles, the Sidewinder M-TX LE and its weight challenges the most fit, aggressive and skilled rider. Drivers must understand lines, terrain drop, and changing snow conditions. The Yamaha Mountain Ski seems to handle the big motor’s weight really well. Yamaha’s mountain ski is above par and is excellent. The motor in the Sidewinder M-TX LE 162 is gentle in the trees and lumbers along quite well; it can be held in a steady-state throttle position through the trees. But, when throttle pulses are needed for a quick pop around a tree, the motor responds very well. When dropping the RPM after a full-throttle assault, the Sidewinder M-TX LE does not drop an anchor, it free wheels rather well like a two-stroke snowmobile. The M-TX LE has Fox Float QS3 shocks, which are lighter than the shocks on the B-TX LE. The front end has more travel as well. Sidewinder M-TX LE owners need to understand the fact it is heavy compared to its two stroke-powered competitors. But (and we repeat ourselves here), there is the power behind a turbocharged four stroke. The Sidewinder’s three cylinder 998 with 12 pounds-per-square-inch max boost, is a 200 to 205 horsepower (some claim 210) all day at all elevations. 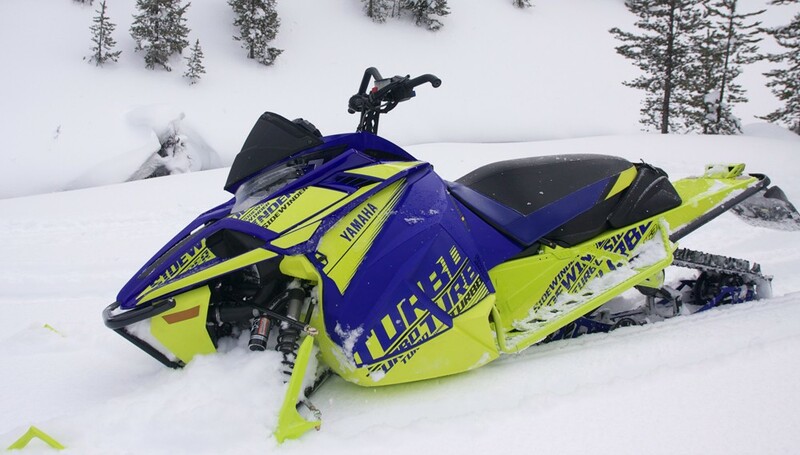 This makes the Sidewinder M-TX LE a mad snowmobile when busting the steep-and-deep because its power-to-weight bests its stock two-stroke competitors as the air thins when elevations rise. The Sidewinder M-TX LE handles the above-mentioned horsepower quite well as it relies on Yamaha’s specific and designed-for turbo application “YSRC High Performance Clutch System.” The Sidewinder M-TX LE starts at a smooth linear rate then unleashes its hard-hit attitude at mid-range, and then shifts fast to its top RPM. The LE’s shocks on the front suspension and on front rail on the rear suspension, is the FOX Float QS3 (Quick Switch 3), where drivers can set from three settings, soft, medium and hard. The rear rail shock on the rear suspension is the Fox Float 3 QSL (Quick Switch Lockout 3), where soft, partial lock and (almost) full lockout can be set. Full lockout keeps the nose down as the rear skid resists floating up into the tunnel. The 162 Sidewinder M-TX LE, fully loaded with Fox QS3 and QSL 3 shocks, and three-inch paddle track make good use of its 200-plus turbocharged horsepower. The Sidewinder M-TX LE is a delightsome mountain snowmobile, but one that needs respect, and patience with its weight. Its narrow ski stance, 36 inches, and its low and reward-positioned chaincase make it fairly nimble. Furthermore, it has narrow runningboards and cinched-in and smoothed-out panels (the B-TX LE shares these as well). 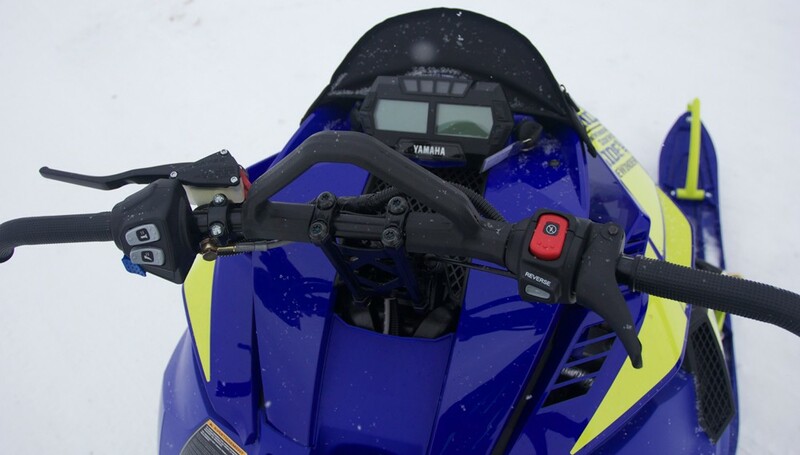 With Yamaha’s reputation for building strong durable motors and clutches, the Sidewinder M-TX LE, as well as the B-TX LE, is a snowmobile an owner can own and operate in the mountains for many years. If the weight bothers you, just know, its 200-plus horsepower carries its weight very well, but in the slow turns and pin-and-wiggle moves in the thick brush and trees, the Sidewinder’s weight can be, and will be, challenging to the rider, however, the right master can master the 2019 Sidewinder M-TX LE 162. Below is a quick snapshot, laying out in detail, the differences and similarities between the 2019 Yamaha Sidewinder B-TX LE and M-TX LE. Front Shocks / Travel Fox Float QS3 / 7.0 in. Fox 1.5 Zero QS3 / 9.0 in. Rear Suspension / Travel Dual Shock SR 162 / 16.5 in. Uncoupled 153 / 15.5 in.